Main Fiction: “If At First…” by Peter F Hamilton. Originally published in The Solaris Book of New Science Fiction. Peter F. Hamilton was born in Rutland in 1960 and still lives in that county. He began writing in 1987, and sold his first short story to Fear magazine in 1988. He has written many bestselling novels, including the Greg Mandel series, the Night’s Dawn trilogy, the Commonwealth Saga, the Void trilogy, two short story collections and several standalone novels. Your narrator this week is Rikki LaCoste. Rikki wears a variety of hats, caps, berets, and on occasion, a bonnet or two. 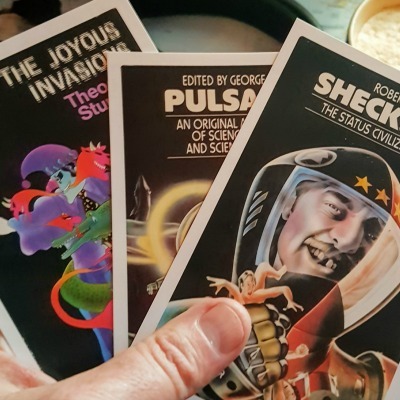 In relevance to audio narration and podcasting, he is a regular reader for Pseudopod; and recently produced, narrated, and wrote music for an episode of Cast of Wonders, on which he will be audio producing from now on. His thirteen year old daughter Isis LaCoste also has credits in Pseudopod and Cast of Wonders. He was also the creator and co-host of a quirky yet provocative podcast called Kakophonos Internet Radio – which is presently in cryogenic suspension – a link to memorable clips from the archives to which you can listen will be in the show notes. Panthea is his musical collection of original compositions. He is also an environmental activist, having worked for Greenpeace Canada, the Communications Steward for Alfheim Valley Eco Resort, he’s an Elutriation Therapist. Among the few ambitions Rikki wants to accomplish in his life, perhaps chief of them is to have Tony C. Smith collapse into his signature speech-arresting chuckles during the reading of his perhaps long-winded bio. Once he has achieved this goal, his life would be complete. Ah … Now my life is complete. Glad to be of service, good sir! Excellent! Fantastic to know! He’s a one of a kind writer and his take on the fantasy genre is nothing short of revolutionary. You should start with The Blade Itself for his adult books, and Half a King for his young-adult books. And have fun with them!